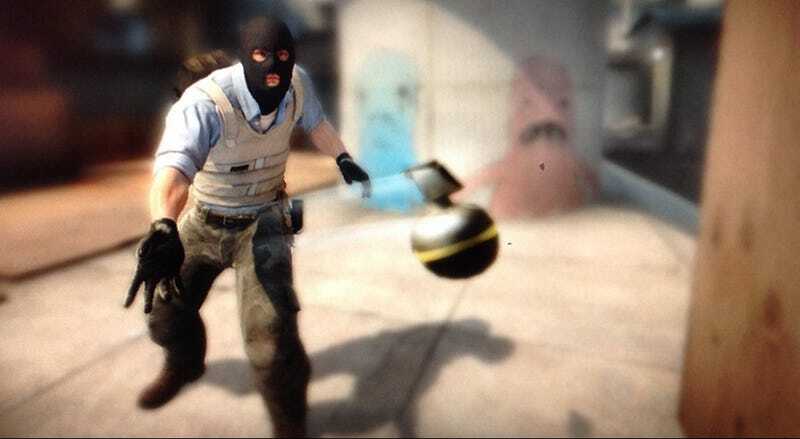 In Counter-Strike, nobody’s entirely certain how molotov cocktails are supposed to work when smoke grenades enter the picture. Sometimes smokes put out molotovs when they land on top of them, but not always. Other times, smokes magically douse flames through walls. Recently, it even happened in a pro game. During a StarSeries Season 3 match between NiP and G2, NiP benefited big time from the notorious glitch. One G2 player hurled a molotov to block NiP’s push out of a narrow corridor, but smoke from a smoke grenade clipped through the wall and immediately extinguished the fire. Whoops! Fast forward to 10:15:23 to see the moment unfold. No longer pressured by what should’ve been a reliable counter, NiP sprang into action and took G2 by surprise. They went on to narrowly take the round. Obviously, it shouldn’t have happened that way, but this bug has been around for ages—more than a year, by some players’ estimates—and there’s simply no accounting for it. In fact, during the same tournament, another team, FaZe Clan, fell victim to the same bug, except this time, their smoke grenade bounced out of the enemy team’s molotov fire instead of deploying immediately and putting out the fire, like it’s supposed to. Ultimately, they lost that round. People have been asking Valve to fix the bug for a while now, but so far, no dice. In regular games, it’s irritating, but when the stakes are as high as they are in a pro match, this kind of thing becomes far less excusable. Here’s hoping Valve gets this one figured out sooner rather than later.